Over the years, a lot of people (mostly men, let it be said) have asked for poems about cricket. So it is with great pleasure, and a bit of a drum-roll, that we present Ten Poems about Cricket selected and introduced by John Lucas, who knows a thing or two about both. 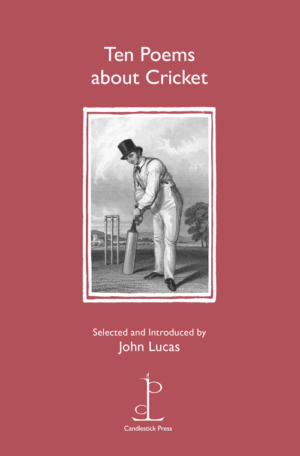 In his Introduction, Lucas writes: “Ten poems about cricket? Given the number of good poets who have written about the game, to choose a mere ten is mission impossible.” Although it may indeed be “mission impossible”, he has nonetheless chosen ten superb poems to whet the appetite, including one that he describes as “quite possibly the best poem about cricket ever written”. The poems capture the game and its history, the excitement of the moment and the hinterland of reminiscence, eulogy and elegy. Poems by John Arlott, Adrian Buckner, Joan Downar, Philip Hodgins, Brian Jones, John Lucas, Matt Merritt, Hubert Moore, Norman Nicholson and Kit Wright.